Here is the winning blog entry for our Mother Earth News Fair contest. Thank you for your submission Amanda-it is insightful and looks delicious! Enjoy everyone. This spring I have home grown vegetables in spades. I planted my first squares of sugar snap peas, beets, carrots, greens, and radishes on March 21st, the first day of spring. Nine weeks and a couple plantings later, I have lots of short plants, and am already harvesting my first baby greens for salads. One of the concepts taught by square foot gardening is eliminating the space wasted between rows of plants. Instead you make a grid of square feet in your garden, and each square foot can be planted with a certain number of plants. 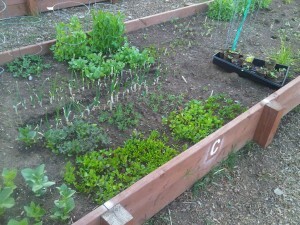 You can see the influence of square foot gardening in my patchwork blocks of greens. 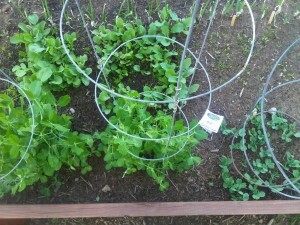 On the left side of this photo you can see alternated squares of spinach and mesclun greens. To the right of the greens there are squares of kales and chard. 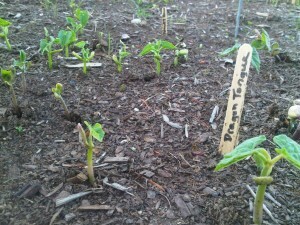 This picture was taken six weeks after planting. This out-of-print gardening classic was my ever-present companion in my teens. I read it over and over, learning about planting in wide rows. The advantages of planting in wide rows include: it keeps roots cool, discourages weeds, and makes the most of limited garden space. Basically you plant as closely as the seeds allow in blocks or rows up to four feet wide. At the bottom of this photo you can see my blocks of peas. And here are my blocks of bush beans. They’re just coming up now. Another reason I love planting this way is that I am addicted to seed catalogs. The descriptions sound so delicious and the pictures are so lovely that I want them ALL. All the seeds. The end. This picture is of one of the blocks of greens. Rather than spacing them evenly, like they recommend in square foot gardening, I scattered the seeds in a wide row sort of way. 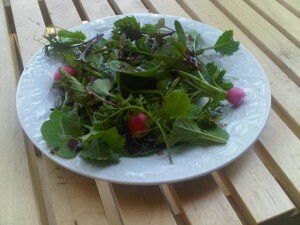 This makes for a really full and fluffy square of Mesclun for salads. 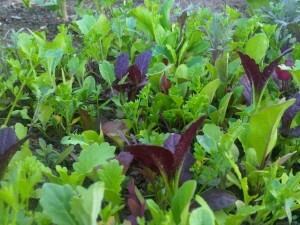 I’m drooling just looking at this mix of red lettuce, arugula, kale, dandelion greens, and who knows what else. 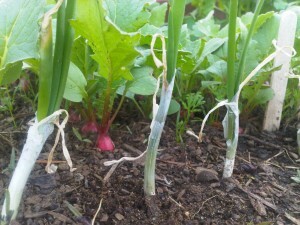 Behind the row of mixed onions you can see baby radishes companion planted along with carrots. 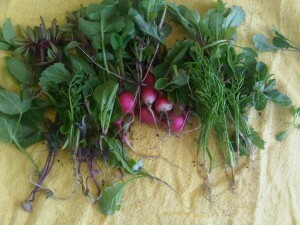 The basic idea is that the radishes will mature quickly, and will be removed just as the carrots need the space. 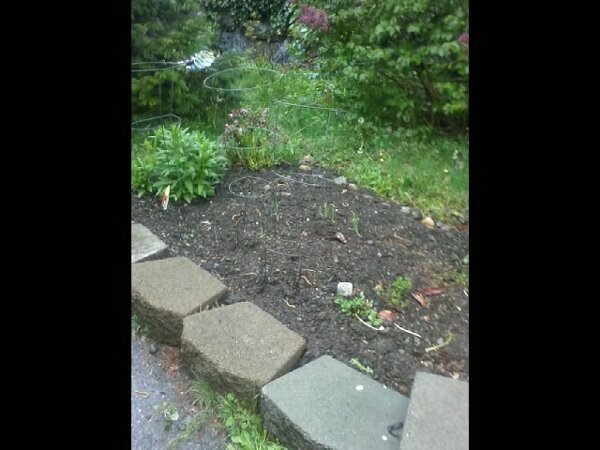 Meanwhile, there are few weeds, and no wasted space at all. Succession planting is a relatively new concept to me. Basically it means planting an area several times during a growing season. As one crop matures, you replace it in the same year with something else that will grow to maturity before the end of the growing season. This seems to require a degree of planning and thought. Some plants do better in cool weather. These are better planted in the early spring, and then again at the end of the hot summer, before the frost sets in. These types of vegetables include peas, spinach, broccoli, cabbage, cauliflower, kale, and fava beans. Other vegetables, like potatoes, tomatoes, squash, carrots, green and shelling beans, and corn need the heat to grow well. By scheduling your plantings, you can make a tiny gardening space work overtime. Everything is growing so quickly now that the weather has warmed up. This picture was taken a couple days ago. You can see how much everything has grown in just a couple weeks since the first garden picture was taken. Particularly the blocks of greens have really filled in and are starting to look pretty crowded. You know what that means…Dinner time! Pinch off the roots and wash the veggies well. A good soak will help to loosen stubborn soil. Drain and dry your greens. You can chill them at this point and they will make an extra crunchy salad. Just wrap them in a paper towel and put them in an airtight container or zipper bag in the fridge. Meanwhile, you can make the simple dressing. Whisk all ingredients together until thoroughly combined. Keeps in the refrigerator for a long time. Arrange the greens on a plate. Drizzle the dressing ever so lightly over the greens. Serve to your friends, or anyone you want to impress. Expect ooohs and aaaaahs.